Forget Thomas Hardy. Forget Dylan Thomas. Let’s talk about the Thomas who has made more impact than any of his namesakes. Let’s talk about Thomas the Tank Engine. I want to make one thing clear first. Nothing would make me happier than taking a flame thrower to Thomas or blowing him up with a stick of dynamite. You see, as the mother of three sons, over the last 18 years I’ve read every Thomas book and watched every spin-off video. I’ve even sat through that awful film starring Alec Baldwin which was like having pins stuck through my head. I’ve also trudged through countless engine sheds and had my bones shaken till I’m on the edge of a breakdown whilst enduring “fun” steam rides. In addition, I hold Thomas personally responsible for the time when pregnant with No 3 the miniature steam engine I was sitting on derailed. If that imagery isn’t enough to make you queasy, let me tell you I’ve also risked my life by driving with one hand whilst pointing out the window and yelling “Look, there’s a steam engine whoo-whoo!” Yes, when you’re desperate to avoid the kids stabbing each other in the car even a steam engine becomes interesting. In fact I’ve been known to become almost orgasmic at the site of a puff of smoke or high pitch whistle when faced with the alternative of another rear seat punch up. I’ll not deny too that my evenings reading Thomas books, which I found poorly written, repetitive and unimaginative, were sheer utter torture. Subsequently, after many years of agony, the day I took those books and videos to the school fayre was one of the happiest days of my life. Knowing I would never again hear that monotonous music or Ringo Starr’s uninspiring narration was like winning the lottery. However, no matter how much I despised Thomas, no matter how much I wanted to read books with more interesting “puffing and panting”, I only parted with Thomas when my boys were ready. Why? Because Thomas the Tank Engine had given them heaps and heaps of pleasure and entertainment. Countless hours were spent reading, watching videos and building train tracks that would span several rooms. What’s more, when my boys were sick and incapacitated I could always rely on Thomas to spin a little magic. Thomas was a hero unmatched by any other preschool book or cartoon character. Look, what’s wrong with these left wing academics? Are they all nuts? Thomas the Tank Engine is about steam engines with silly faces! Do we have to take all this politically correct mumbo jumbo so seriously?! If so, I want to object to Postman Pat because frankly he spends far too much time in the company of sheep and I find that more worrying than one of my sons becoming a train spotter. Oh alright, I’ll be sensible for a moment. 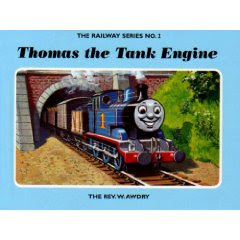 Thomas the Tank Engine was written in the 1940s by The Rev W Awdry, a Church of England vicar. Of course it’s going to reflect the age in which it was written and the Reverend’s experiences but does that mean it should singled out as a bad example to children of today? No, it shouldn’t. By all means, if some people want to use it as a learning tool to educate their children about feminism and social class, then that’s their prerogative but I seriously doubt whether any preschool child understands such concepts or is likely to be subconsciously influenced by conservative ideologies. In my experience, little children are only interested in the adventures, the colorful characters and a happy ending. And that’s the way it should be. I agree with Professor Wilton that we should be concerned about what our children watch and read, but I’m afraid my concerns are primarily if they have access to unsuitable adult material. I believe that as children grow they have to learn to assimilate information for themselves and to differentiate between fact and fiction, past and present, right and wrong. Reading childhood literature from other eras is part of that process. It’s a way of opening up the world to them in an educative and creative way which allows them to safely explore new worlds both real and imagined. Forcing a child to see your own opinions, which may be invisible to them, undermines this process. It may even curtail their pleasure and be indoctrination of the worst kind. The truth is I’m concerned that this wave of political correctness that started out as a well meaning intention to protect civil liberties, has now spiraled out of control. Children’s literature is becoming increasingly “inclusive” and many words and terms have now been branded offensive when there is no offense intended. Of course, I want to see literature that is representative of all aspects of society and of course I don’t want to hear genuinely offensive words but what happened to reflecting the interests of the majority and the concept of free speech? And where will all this ridiculous moral sanctioning end? When the likes of Awdry and Blyton are banned for being too sexist and middle class? I hope not, but Professor Wilton is typical of a new breed of academics and politicians who seek to assert their own opinions of universal equality and conformity on all. Their tolerance has become intolerance and to my mind that’s not political correctness or democracy. It’s fascism. You know, I think there are a lot of good, strong moral messages in Thomas the Tank Engine. I don’t agree that the messages in Thomas “punish initiative” but instead offer clear definitions of what is right and wrong; naughty behaviour is punished and good behaviour is rewarded. These are simple, effective messages for a young child to absorb at the age when they are discovering and testing their parental and social boundaries. They are important lessons to learn for any child, or indeed anyone, who wants to live within a functioning society. So should I be lucky enough one day to become a grandparent, like millions of other grandparents and mums and dads all over the world, I shall be reading Thomas the Tank Engine to my grandchildren. Possibly I’ll feel less vehemence towards him then and I’ll only remember the delight on my children’s faces as I peep-peeped and poop-pooped my way through all the adventures. And as for Professor Wilton? What she needs is good ride on a steam engine with a tender behind. I've got a girl so it's Dora the Explorer!